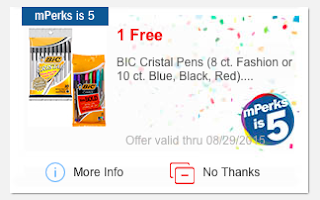 CHECK YOUR mPERKS ACCOUNT'S FOR THE SECOND FREEBIE! No code needed, all you need to do it log into your mPerks account and it should be there waiting for you! You need to clip this today, Tuesday, but you have until Saturday to redeem it!! !